The following is a conversation between Earl Lewis, President and CEO of the Andrew W. Mellon Foundation and Denver Frederick, Host of the Business of Giving on AM 970 The Answer in New York City. Denver: As the arts, humanities and liberal arts have fallen out of favor in recent decades, they have known no better friend, no more loyal friend than the Andrew W. Mellon Foundation. And it’s a great pleasure to have with us this evening their President and CEO, Earl Lewis. Good evening, Earl, and welcome to the Business of Giving! Earl: Thank you! My pleasure. Denver: Tell us about Andrew Mellon, the person, and the foundation that bears his name. Earl: Andrew Mellon had his origins in Pittsburgh. His family of Irish immigrants had moved to the Pittsburgh area. By the late 19th century, they had tried a number of things, and they moved into banking. So it was the father and two sons. Andrew was one of the two sons. And if you think of the late 19th century, if you think of Pittsburgh– in particular the rise of the industrial era, and people like Carnegie and others who were in their midst– they actually went into a “new world” – what we think of today as venture capital. They actually would make loans to enterprises through their banks and then recoup the dividends on the backside as those enterprises developed. Think of Gulf Oil. They were early investors in Gulf Oil among other kinds of enterprises. And if you read Malcolm Gladwell’s book, The Outliers, there is a chart where Malcolm attempts to identify the wealthiest human beings of all time. And you realize that there’s a name: Andrew Mellon. They are among the top 10 or 11 individuals, well above Bill Gates and Warren Buffet, and not too far from some of the others that you think of as among the wealthiest. Andrew Mellon would then go on to become the Treasury secretary in the 1920s. He would go on to create the National Gallery of Art in Washington D.C. He would die in the 1930s. And then his children, Paul Mellon and Ailsa Mellon Bruce had two separate foundations as they inherited wealth from their father’s estate: the Avalon Foundation and Old Dominion Foundation. And in 1969, while the kids didn’t always agree on everything, they agreed to merge their two foundations and rename it for their father. Hence, it was born in 1969, the Andrew W. Mellon Foundation. Denver: And when you arrived there about four years ago, I don’t know if any foundation could have had a much lower profile than the Mellon Foundation did. It had a very static website; you had no communication staff whatsoever, and really not much of a public face at all. But you’ve changed all that. What have you done? And why do you think it was important to do it? We heard them. As a result, the decision was made that certainly we needed to do something with our website. It was as much a spider web as anything because things had been stuck there for a long, long, long, long time. And we realized with that portal, we could begin to communicate not only something about our mission and our values, but also more about our grantees. And I think of all the things I did like in pointing out, when people turn to the website, at the bottom of the homepage is now a listing of every grant that we’ve made since the inception of the foundation in 1969– mapped not only by the amounts and the topics, but also geographically. And you get some sense of flavor of who we are and what we’re about. …there’s a way in which art… dramatized on stage… can tell us about our past, and provide the insights into the present in ways that even the most beautifully written book, or the most well-executed speech, never can. Denver: That’s great. Well, you have to have a voice in today’s world; you can’t just be writing checks. Well, the foundation fervently believes that arts and humanities play such a vital role in democracy and help promote understanding of different peoples and cultures. Tell us about some of your work here and some of the projects that you have funded. Earl: We have funded a range of projects. Let me use a contemporary one. We have been working with the Oregon Shakespeare Festival, and they have been underwriting the attempts of a new generation of dramatists to come up with what we think of as the American history cycle, and working through stories about American history. That to me is exciting because you realize, as we discovered last year with the enthusiastic reception of Hamilton, that there’s a way in which art… dramatized on stage… can tell us about our past, and provide the insights into the present in ways that even the most beautifully written book, or the most well-executed speech, never can. And so that’s one example of the kind of work that we have been about. One other example: we’re working with universities and schools to make sure that they understand themselves as playing critical roles in their communities. And so we have been trying to help them as they develop new kinds of research projects, that in some cases at Vanderbilt, where they go out and not only talk about their relationship to Nashville but turn their students– in partnerships with community elders– to actually capture the history of the elders in and around Nashville. So the students, whether they come from Tennessee or they come from Texas, have some understanding that Nashville and Vanderbilt are interconnected. Denver: I’m going to ask you this from a place of ignorance, Earl. Where do you see the arts and humanities in our overall culture? I’m not talking about the university or the academy here, but the everyday appreciation among our citizenry of philosophy and history and poetry. Are the American people caring less about these things than they once did? Earl: That’s a hard question to answer, but let me try to bite off a little piece of it at the very least. If we look at the number of people who read… and read the newspaper as a market, we realize that fewer people read the newspaper today. It’s like 40%– compared to a generation ago with 60% to 70%– who are reading the daily newspaper. So that reading appetite clearly has changed. But if you go and look at festivals and where people show up for a festival in and around a topic, and they end up in programs at BAM over in Brooklyn, or they go elsewhere, we’d realize the appetite for cultural understanding is not dying at all. It may be diversifying, and that diversification is the challenge because in the past, you had to go someplace to receive it. Now, you can sit at home and actually tap into YouTube, or you can tap into a live video stream and still receive some sense of what it means to be part of the cultural world that is America. Earl: Different platforms, different portals. Denver: Well, as you know, there’s been a considerable discussion in Washington that the Trump administration has now proposed to do away with the National Endowment for the Arts and the National Endowment for the Humanities. Not a good idea, you say; in fact, a pretty dreadful one. What is their importance? And why would they be so missed? Earl: If you think about it, it was only 50 years ago that Lyndon Baines Johnson, when he was president, created the National Endowments for the Arts and Humanities. He did so with bipartisan support. Among the people standing there on the day of the signing was one Paul Mellon, who showed his appreciation and support for the idea that the federal government has a role in making sure that the arts and the humanities are advanced because they do three things. One, they provide us with a sense of our relationship to our past. I mean, a nation going forward with no sense of its past is a lost nation. And two generations ago, men and women of stature and understanding believed then we have a responsibility as a society to invest there. The second part is that the arts and the humanities also provide a way for small communities to unearth in their relationship. And so you’ll see, if you were to read about the NEH, they’d been supporting these small communities in Appalachia to write about their own history. So, is that important? Yes! It is as important as actually knowing something about the digital code that makes Google work because for those folks in those communities, we’re now understanding who they are and being able to tell the world. We end up saying that some people are more disposable than others, and that actually frays the fabric of the democracy if you end up telling some people they’re more disposable than others. And the third piece, and this is the one that I think is really important: the arts and the humanities through the Endowments, touch all 50 states. It is one of the ways in which we understand through the humanities councils and the state councils and all, that arts and humanities are not a Washington D.C. thing; it’s a United States of America thing. And the idea that NEA and NEH would disappear leaves me with this great sense of absence, and we want to avoid the day of absence. Denver: What do we do about it, you think? Do you think that the arts community is going to step up? Or, do you think that this is not the level of concern that we…? Earl: The arts community, my guess, will continue to rally and voice its support for the Endowments…. the humanities communities as well. Professional associations and organizations have been working to make that point. And my sense is: there are members of Congress on both sides of the aisle who recognize that a grant from NEA or NEH actually touched someone in their district. And that multiplier effect, because it’s not only to that entity in that district, but in all the other people who benefit. So it has both an economic driver component, as well as a social and a cultural one. Denver: And matching funds… and all those things that come along with it. And it’s really not that large amount of money at the end of the day. It’s just a couple hundred million dollars in a trillion dollar budget. Earl: Yes. I think we point out that the two Endowments combined account for 0.00004% of the national budget, not even rounded there. Denver: Let’s turn our attention to higher education, if we can. One of the things that have always set Mellon apart from many other grantmaking institutions is your ability to take this long, long view– well beyond that 3-5 year grant cycle. One of those investments started with Henry Drewry about 30 years or so ago… a pioneering black educator and a founding director of the Mellon board. What he wanted to do was increase diversity and faculty ranks of institutions of higher learning. Tell us about that program and the impact that it has had, Earl. Earl: So that program we now refer to as the Mellon Mays Undergraduate Fellowship Program was indeed crafted by Henry and Bill Bowen, a former– now late– President of the Andrew W. Mellon Foundation and Princeton University. And so I love this program in a lot of ways, and I love it for three reasons. It illustrates, more so than anything else I think we’ve done in the last three decades, the importance of taking the long view. We have a graph to show what would have happened had we ended the program after 5 years or 10 years or 15 years or 20 years. What happens is a fellowship program will begin to identify young people in their sophomore and junior years in college, and then for those who elect to go on to earn their PhDs, we provide additional support. The goal was to increase the number of PhD recipients. And what happened is, over the years, we now have about 700 individuals who have actually gone on to complete their PhDs. And we have another 600 in the pipeline. We have 200 or so who are in tenure-track positions, including some college and university presidents and provosts. But it’s the compounding effect. And for us, Henry and Bill had a vision. Sixty-five institutions over time joined in the creation and the maintenance of that vision. But it’s the hard work of staying the course, decade after decade, individual after individual, and imagining that they’re all successes– whether they earned their PhDs or not– but even more so if we could help to diversify the faculty in the United States. …intellectual capital works in the same way as financial capital. Denver: Well, you know, it’s funny how we all understand the power of compounding when it comes to our money… but not necessarily these initiatives and these kinds of programs. Earl: Yes! Exactly. And if you think of it, intellectual capital works in the same way as financial capital. Denver: You have a very interesting perspective about the role of the university in the years and the decades ahead. And my goodness, there certainly has been a lot of debate about that recently. But you think that they are perfectly positioned to take on the grand challenges of our time. Share your thinking with us on that. Earl: If you think of most colleges and universities, they’re the one entity that’s not going to go away. It’s the rare college. It’s not to say there aren’t some, but it’s the rare college and university that shutters and closes its doors and moves off shore or somewhere else. They are a real anchor institution. Many of them are the leading employers in their areas, in the rural areas or in large metropolitan cities, in part because they provide not only education but also health care in many instances. So, as a result, I think if you ask any question that needs to be addressed, where do you turn to find the resident intellectual talent that’s going to be required to address those questions? It’s the university. There are smart people always coming through, and if you think of it, we recycle 25% of the undergraduate population on an annual basis. We’re bring in graduate students every year, and so we replace them every three years or so… or three to six years depending upon the discipline. Faculty, maybe a little less; we turn them over about 10% a year. But there’s also this churn and renewal that’s going on. And so, I actually think that as an anchor institution equipped with talented people, then who better to think about what are the grand challenges that have to be addressed: How do we talk about labor and the changing nature of work in American life? How do we deal with questions of inequality and what that will mean? How do we deal with all issues that we’d rather not talk about, like the institution of slavery and its 250 year relationship with the republic we call the United States of America? Who else is going to take on these thorny, pressing issues, depending on what you think about climate change and all? Universities and their people. And so, I believe as we look out over the next period–let’s go back to labor. We know that all projections indicate just the introduction of semi-autonomous or autonomous vehicles could reasonably displace six to seven million long-distance truck drivers. Denver: That’s right, which I guess is the largest job for men in the United States right now. Earl: Exactly right! Yes. And so what happens? To know this is one thing, but to know it and not do something about it is something else. And so I’ve been saying to my colleagues in the academy, “Our responsibility is not only to point out that there’s a challenge or a problem ahead, but also to come up with creative solutions.” And it may be that, yes, the front door to a major university or college may not be the best place, but many of them also have continuing education programs. What happens if we revamp our continuing ed. colleges all across the country to deal with that six to seven million who will be displaced over the next decade? My colleague Scott Page, who is a complex systems theorist at the University of Michigan, will argue that the more complicated the problem, the better results you get if you have a diverse set of actors working on that problem. Denver: And adding on to your point, you’ve said that the universities are a place. And as we tend to look at how we can best solve our problems these days, it’s bringing people together from different perspectives, and they’re all right there on campus– from every possible discipline. Earl: From every possible discipline… and notwithstanding sometimes what we see in the news media, from a variety of ideological perspectives as well. And so people don’t actually come in and address the problem in the same way… or come in with the same assumptions. My colleague Scott Page, who is a complex systems theorist at the University of Michigan, will argue that the more complicated the problem, the better results you get if you have a diverse set of actors working on that problem. And you think then if we can identify those key complex problems, taking advantage of those diverse set of actors will redound to the benefit of all of us. Denver: Yes. I think somebody said once that solving a problem is sort of like a desk drawer, you don’t need 12 pairs of scissors. You need a scissor and a stapler and some Scotch tape, and that’s what the university provides– people coming from all different perspectives and having different looks at the problem. …if we are going to work as true partners with the communities that we are part of, we have to actually go in and adopt a partnership model rather than an expert model. That really is the future, where we actually think about what it means to be partners with the individuals and the communities because, believe it or not, they, too, have knowledge. And it’s the combination of their knowledge and our knowledge that actually may in the end result in a solution that’s most viable. Denver: You’ve said that in order for universities to survive and thrive that they need to rethink their partnerships with their local communities. How so? What should they be doing? Earl: Yes. For a long, long time, many colleges and universities believed that they were the home of the resident expert. And if we go back to the 1950s, we created what I refer to as the expert culture. And so people started to look at Doctor Spock and read his book, and we turned to a whole series of experts. That day a little bell went off in my head, and one that has been ringing ever since. That’s the future! That really is the future, where we actually think about what it means to be partners with the individuals and the communities because, believe it or not, they, too, have knowledge. And it’s the combination of their knowledge and our knowledge that actually may in the end result in a solution that’s most viable. Denver: So learn to listen a little bit, I guess, was the message. You know what I mean. Earl: Yeah. Be a little a humble and reducing one’s “arrogance” is always a good thing. Denver: You’ve spent so much time in higher education, and you’re still so closely aligned in a variety of ways. I wanted to ask you about the resiliency of today’s college student. Because this seems to be an issue of growing concern. Many successful young people are coming out of high school, but they’re quite fragile, and there isn’t a great capacity to bounce back from failure. What is your observation on this? Earl: I have seen a lot of kids who’ve actually overcome extraordinary obstacles to get into some of the most selective colleges and universities in the United States. Are they resilient? Yes. In fact, I would say they sort of created their own version of a Teflon coating to be able to deal with all the knocks and bumps that they have acquired over the years. But I’ve also seen other kids who have been nurtured in such a way that they had actually never known failure. Sometimes it’s in the university setting that they experience their first failure. And then the university has to provide them with the other kinds of elements that will allow them to overcome that sense of displacement. I had to say to my admissions officer when I was provost at Emory, I said, “Go find me a kid who’s failed a couple of times,” because I actually think they’re a critical part of a class. If we only have the kids who have always been most successful and never failed, and that’s the only way we identify a class… we actually are not creating the best learning environment for all of our students. And so it’s the mix of–because the kid who had that homemade Teflon coating… living with the kid who knows nothing about success… makes for interesting roommate pairing because each will be likely to learn from one another. And I think that’s part of a challenge that we have, is to make sure that we accept in colleges and universities the responsibility of actually constructing a class. Although a piece of this is also that there are young people who are now attending college who wouldn’t have attended the generation ago, partly because our medical tools have actually improved tremendously. We now can use various kinds of psychotropic drugs to deal with anxiety disorders and other kinds of impediments that would have made it impossible, a generation or a generation and a half ago, to attend college. We want those kids in college. We understand they actually played a different role. But it also has required the university to think anew about how we monitor and what we measure as success as they go through the learning environment, and how we accommodate their needs, and at the same time, change some parts of the institution. Denver: Very interesting! Well the importance of education in your own life, Earl, and in your family, was in many ways driven by your maternal grandmother. Why don’t you tell us about her? Denver: She probably went with the early 20th century! Earl: She went with the early 20th century version. There was a five-year spread there. But she grew up, came of age in rural Virginia, living outside of what’s now the city of Norfolk. But she always had a real pining to go off to college. So she saved twice to go to Saint Augustine College in Raleigh, North Carolina. And each time she saved the money and was prepared to go–she wanted to be a nurse–her father turned to her and asked to use that money to save an older brother from being dispossessed of his home. So twice, my grandmother did. And so as a result, she then married and had three kids, and she herself never got to go to college. Earl: A dream deferred is not a dream denied. And she would actually send not only my mother, but all three of her children, would go off to college. Denver: Fantastic. Let me ask you, Earl, what’s it like to run a foundation? And I ask you in a context of someone who’s been a professor, an administrator. You mentioned before being a provost at Emory University, and now the President of the Foundation; all have different duties. I would suspect they call for different skill sets. Earl: They are different. In each of these roles, if I would define one singular characteristic that makes them similar, it is about leadership and being able to identify a set of critical questions to get others to wrap their mind around: “This is what we need to pursue; we can articulate a mission and a vision, come up with a plan that we can then go out and execute.” So in that sense, everything I’ve done in the past has prepared me for this particular job. What’s different is that you have a different set of stakeholders. Being inside of a university environment, you’re reminded on a daily basis that you have 18-21 year olds who are impatient for change in the world. And I used to always say to my students, “If you are 18-21 years old, and you don’t believe that you can make the world better, then we’re all in desperate straits.” And some days I would be reminded of this with a great intensity. You have faculty who used to always jokingly say “Presidents and provosts and deans come and go, but we’re going to be here for the long haul.” And so you had that element with students, a sense of change with the faculty, and a long sense of continuity because they imagine themselves in 30 to 40 year time periods, rather than one to three year time periods. You come to the foundation world, and you realize you live your life in quarterly increments. Every quarter, there’s a new set of grantees who are looking to be supported and have their ideas actually then supported. And so time is one of the biggest differences, and how you actually organize your life and your days and degrees to which you actually think of yourself in quarterly increments– every three months– versus some other time– a semester or an academic year. And so of all of things I have noticed, more than anything else,it is how one thinks about time. Denver: I would have never thought about that. That’s just fascinating. I’m always so interested in the corporate culture of an organization and what leaders have done to create an engaging and an empowering work environment. Tell us about yours in Mellon. Earl: So in Mellon, it’s a very tight-knit group in the sense that there are a number of people who have worked at the foundation for a long, long, long time. And then one of the things that we decided that we needed to do– as we looked out over the set of opportunities we were going to pursue for the next decade or so– is that we had to grow the staff. We had long prided ourselves on being among the leanest foundations in philanthropy, and we are. We have $6 billion in assets, and when I came in, we had about 75 staff. We, with the board’s approval, have agreed to grow to 100 staff. But that also meant then that’s a 25% increase. It raises questions about the culture of the place. What happens when you grow that fast and that rapidly? Earl: We are–coffee, tea but it’s not an agenda. It’s actually an ability to build community, so that’s one. Two, we’ve spent more time talking about professional development than we have. And so we’ve redone some parts of our human resources elements to ensure that everyone can imagine where they fit in the organization, what their career trajectory can be. And the third thing, just to make sure: everyone gets to understand our strategic plan and their role in it. And so this is not management’s plan or senior management’s plan or the board’s plan; it’s actually the foundation’s plan. And so we have made sure everyone understands that that new website that you referenced earlier was there to really showcase the work that they do. And so that’s actually been a lively, ongoing discussion that really has proven to be quite invigorating for many at the foundation. Denver: Well, they always say that the best culture is one that everybody there helps create, and that sounds like what you’ve done. Earl: Absolutely! And it’s a work in progress, but we’re working hard at it. Denver: Looking at philanthropy from a broader context for a moment, you have said that you think philanthropy can be an architect for change. Ford now is addressing inequality, just about exclusively; Rockefeller is tackling climate change and resiliency. What do you see as the next big opportunities for philanthropic investment? And I was at a meeting out in California in the summer where one CEO of a major corporation was saying, “We’re betting on the fourth industrial revolution. We’re betting on that digital material, biological material, mechanical material will be blended into a new set of tools, instruments, et cetera that will enhance the efficiency of the workplace.” Fine! For some people that’s Frankenstein; for others, that’s Rosie from the Jetsons. Denver: They’ve been on the show… Max Kenner. It’s a remarkable, remarkable program. Earl: And one of them, the guy was saying, “You know, I’ve learned some skills,” but it was not the skills that were most important. But I took those courses in philosophy and in history and in literature. And all of a sudden, I realized the skills I learned… I could put them in context. I could understand them. And when those skills became obsolete, I was no longer obsolete, because I had a fuller understanding of the world. That, I actually think is a place for philanthropy to enter. Denver: Very interesting. Yeah Max was on the show, and he had made a great point that in these Bard courses in prison, they were taking philosophy, and they were reading the German philosophers, and they did not like the translation into English. And they made an appeal to Bard to teach them German. So they could read it in the native tongue. I’m like: Really? You know what I mean? Are you kidding? Denver: Well, that kind of leads to me to my closing question which you’ve touched on, but I want you to speak a bit more. Mark Cuban, billionaire entrepreneur and owner of the Dallas Mavericks, I was watching him during an interview on the NBA All-Star game last month, and he was talking about what you were: automation and artificial intelligence. And what he sees in the next 10 years is this tremendous, growing demand for liberal arts majors. He said: “Forget finance; forget programming. Machines are going to do that; we’re going to need people who are free thinkers and can connect the dots.” And the first thing I thought of is that he must have been reading one of Earl Lewis’s speeches. But tell us–it’s such an important topic…Speak to that a bit more as to what you see for the future of work and the liberal arts and how they’re going to work together. Earl: Sure. For almost two decades now, I’ve been amazed that when I travel the world and people tell me that the most interesting part about the American higher education system is this core link to the American version of the liberal arts. I could remember doing some work in China in the late 1990s, early 2000, and people would look at me and say, “What’s your secret sauce?” I say, “What do you mean?” They say, “There’s innovation and creativity; what’s the secret sauce?” And we will always get back to in the end: the answer was the liberal arts. And so Mark Cuban’s comment is not at all surprising to me because I speak to a number of CEOs and all who say, “Look, I can train a person to do A,B,C, or D, but I can’t train them to read well and to think and to be curious. And I can’t train them to necessarily put A and B and C and D together and synthesize it in a new way, because other kinds of educational experiences…it’s more linear than that.” And so for them, they said the liberal arts major is that person who may come in in the beginning who starts at a lower rank, but then they make their way through their enterprises, in part, because they aren’t troubled by ambiguity. And they say, “If anything, in a work environment and a corporate culture, sometimes it’s the person who actually can embrace ambiguity is the one who actually will advance our place in the world. And so when I think about the liberal arts and think about where we are over the next 15-20 years… going back to the questions we’ve been discussing for the last bit here: Well, a liberal arts student is one– if he or she is well educated– is the one who realizes that they need to know science and math. They need to know literature and history. They need them to be able to write and expound upon views in ways that allow them to not only inform themselves but to inform others. And that talent will be in greater demand than ever. And in part because it may be the version of the world that Mark Cuban identified and may actually become the one way that we actually can distinguish what is human. Because if machines can do much of what we have been able to do ourselves– from hard labor to intricate work– then what does it mean to be human? And our ability to write about and think about it, talk about it, may be that distinguishing characteristic. Denver: And to be able to deal at those intersections. 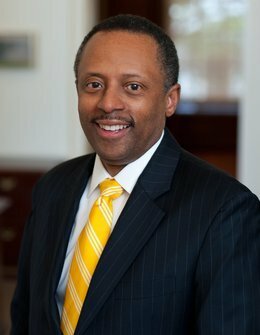 Denver: Well, Earl Lewis, the President and CEO of the Andrew W. Mellon Foundation, I want to thank you so much for appearing on the program this evening. Tell us about that website of yours and the kind of information listeners might find if they drop by for a visit. Earl: So if you visit our website, www.mellon.org, you will see a range of programs that we are both underwriting. We have reference to our series, Our Compelling Interest, that value diversity for a prosperous democracy; you’ll see a little there. You see all of our grants. You see writings produced by people, both internal and external, and you’ll get a sense of some of the people that we’ve supported. Denver: Wonderful! Well thanks, Earl. It was a real pleasure to have you on the program. Earl: Denver, thank you as well! The Business of Giving can be heard every Sunday evening between 6:00 p.m. and 7:00 p.m. Eastern on AM 970 The Answer in New York and on iHeartRadio. You can follow us @bizofgive on Twitter, @bizofgive on Instagram and at www.facebook.com/BusinessOfGiving/.